EDITOR: I recently attended the press launch for Sony’s new Play Station 3 (PS3) PlayTV Digital TV accessory and ABC iView PS3 integration. The PlayTV looked worth reviewing but I haven’t used a PS3 myself so I arranged for Sony PR to send a loan unit to my friend and PS3 fan Tony for him to try out and review. EDITOR: ABC iView is a free internet broadcasting service that offers a range of ABC TV programs streamed in high resolution. Integrated access to it within the PS3 brings the convenience of ‘catch up TV’ traditionally enjoyed through a PC, to the comfort and convenience of the living room TV, for a more immersive entertainment experience. ABC Director of Television, Kim Dalton, says ABC TV’s focus is on making content more accessible. Watching iView through PS3 will be unmetered by those Internet Service Providers (ISPs) who currently offer unmetered access for ABC iView – the full list of which can be found at ABC iView. I was thrilled to be contacted by Neerav Bhatt recently to be a guest reviewer of the Sony PS3 PlayTV. Neerav and I have been connected on social networks like Twitter since late 2008 and regularly meet to discuss and share our mutual interests at the various conferences and networking events in Sydney. Thinking about it, we probably first met at the BarCamp “unconference” in November 2008 where I presented on Digital Media and the Connected Home I thank Neerav for the opportunity to write today’s review of the new PlayTV digital television recording solution for the Playstation 3. For about a year now I have owned a PlayStation 3 (PS3) which I use primarily for watching high-definition Blu-Ray DVDs, and as a media centre. The media centre and Blu-Ray player capabilities of the PS3 are so compelling and useful they will be the subject of future reviews, so stay tuned for those. The PS3 also excels as a gaming console of course and most people buying a PS3 probably have gaming front-of-mind. The PS3 is much more than that, especially now with the release of PlayTV. 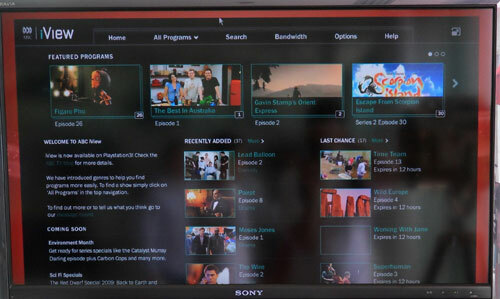 PlayTV allows you to watch and record digital television on your PS3. It’s the latest entrant into the growing “PVR” market in Australia, where consumers are spoilt for choice. Examples of PVRs or Personal Video Recorders are: TiVo, Foxtel iQ and Topfield. Now we have the PlayTV which I believe will drive growth in the PVR market as well as additional sales of the PS3 in the lead-up to the holidays. The PlayTV handles all free-to-air channels available in your location. Note that pay-television including Foxtel and Austar is not supported. It’s all very simple to set up so far – just connect the aerial and the USB cable. Its worth noting that I would like the PS3 to have at least one rear USB port, so there would be no need to see any cables in the set up. It is handy to already have two front USB ports on the PS3 (to charge your controller, add external hard drives etc) but without a rear USB port you have no choice but to permanently use one of the two front USB ports for the PlayTV device. Next step is to take the included installation DVD, insert it into the PS3 and follow the prompts. It was extremely simple. The software takes a few minutes to install, then you’re straight into a guided menu to search and store available television channels. I was very impressed at the ease of this. Finally, the fun stuff: seeing the PS3 in action displaying and recording TV. You start up your PS3, scroll across to the new menu item “PlayTV” and away you go. The first time you switch on your PS3 and start PlayTV there is a delay of about 20 seconds, then you’re watching TV. 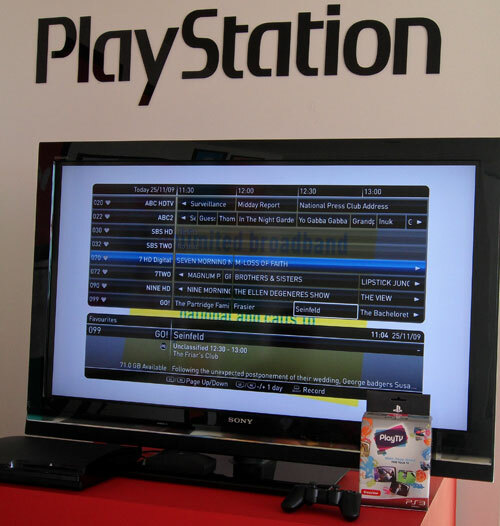 Whilst the PS3 is switched on, the PlayTV will continue to display and record television. The functionality and options provided on PlayTV are comprehensive – they will be familiar to experienced users of PVR/DVRs. I will cover off the important ones as I see them, assuming that most users will not have much experience with PVRs. At any time you can select Live TV and watch what is on right now, and change channels, freely. This is surprising to new users of a PVR – whilst recording a show on another channel, you can pause live TV, and change channels. Over time you will build up a number of recordings (only limited to the size of the PS3 storage – I recommend at least 120GB and prefereably 250GB) Once this occurs you will start to see the real benefits of PlayTV ownership: there will always be something you want to watch, when you want to watch it. You can fast-forward through the commercial breaks. This raises an important point about “time-shifted viewing” What this means is you can record a program on right now, then in a little while start watching it from the beginning, before it has finished recording. The advantage: no commercial breaks. You gradually catch up to the live TV broadcast by fast-forwarding through the commercials. I’m really enjoying using the PlayTV – it’s fast at changing channels, scrolling and searching the guide for programs, and generally navigating around. The menu system, controls and options will be familiar to experienced PS3 users. The optional Bluetooth remote is nice (no mute button though) and easy to use, but anyone experienced with PS3’s wireless remote controller (supplied with the PS3) will be comfortable using that. I’d recommend buying the Bluetooth remote though, as non-PS3 users (family, visitors) are likely to use the system and they will find it easier. Whilst the PlayTV is recording, you are still free to play games and watch Blu-Ray DVDs at the same time. I noticed the media centre capabilities of PS3 were unavailable whilst PlayTV is active. Advanced users may find this frustrating as you must quit PlayTV first. I’d like to see further advancements to the recording system, such as the ability to search and auto-record based on keywords, or recording TV series. For example, search for “Seinfeld”and always record the program that matches that. Currently you must manually select each program for recording, even after searching for it. I hope future versions allow the simultaneous recording of two channels – we are spoilt with free-to-air television in Australia as there is plenty of good content, often on at the same time due to the competitive nature of these networks. Owners of the popular Playstation Portable (PSP) or Sony Ericsson’s AINO mobile phone will be thrilled to find they can watch, pause and record Live TV wirelessly from their portable device. This is a great feature – I wonder if Sony will support other devices (iPhones/iPod Touch comes to mind) but meanwhile PSP/Aino owners are spoilt by this. There will be plenty of software updates to PlayTV which means your investment is protected. Just as there has been to the PS3 software itself this will ensure continued improvements to an already impressive first release of PlayTV. If you do not have a PVR, and have free-to-air television, the PlayTV is a highly compelling option. I noticed one site this week offering a web-only price of $139.00 so do shop around. JB HiFi currently have a deal for $599 – includes the 250GB PS3, PlayTV, an HDMI cable and one game (Assassins Creed) Cleverly this is the same price as the TiVo (excluding delivery) Remember, you also get media centre, Blu-Ray and phenomenal game playing capability with the PS3. The PlayTV will remain a valued member of my television set-up at home. This guest technology review has been written by my friend Tony Hollingsworth (@hollingsworth on Twitter). Tony is a Sydney-based experienced technology executive and Family Man. Passionate about Technology, the Internet, fine food and coffee. Information and gadget geek. Early adopter. Thanks again for the opportunity to post this review. I’m really enjoying the media-loan PlayTV and will definitely be purchasing one to keep – it’s really a no-brainer for current owners of the PS3 like me. I hope your readers find this review helpful and look forward to their comments. Great post, Tony! Not only is it quite informative but quite close to formal documentation which is always lacking with products. I can send this article to anyone and they would get a fantastic overview with actual data and how-to advice. You write in a way that I feel a connection with you, trust you and want to go get one. Neerav was right on to invite you to write this. You rock! Tony, great write-up of the PlayTV + PS3 combo. This past weekend I purchased the PS3 250GB + PlayTV combo and agree with most of your comments above. As a ‘new’ to PS3 user, I feel I can add a little bit more because my purchasing decision was based on a number of things. We needed to get a set-top box (for digital channels) but I refused to purchase a single-use device (such as a set-top box) that did nothing but decode the signal. I purchased the PS3 because it ticked 4 boxes on my list: 1) Digital TV receiver, 2) PVR capabilities, 3) Media Centre capabilities, and 4) Gaming capabilities (not really a necessity but a great way to unwind every now and then). I did not consider the Blu-Ray player as a purchasing point right now as I still use a 68cm CRT (Having Blu-Ray when the time comes to move to a better screen + surround sound setup is a bonus). The finding/recording of shows is very easy – so easy, in less than 3 mins. my 7.5yr old son found some kids’ shows and read the on-screen instructions on how to set them to record! The on-screen instructions make things very easy but they’re also unobtrusive. A downside (to my setup) is that everything looks ‘squished’ on the screen when browsing the guide – I also notice that there is empty ‘screen real-estate’ the screen-capture images in the original post, so would suggest some UI tweaks to provide better usage of the screen real-estate. Note I am only using the PS3 controllers (not the bluetooth remote control, available separately). Playback of recorded content is very simple, quick and efficient; the 30x fast-forward is awesome to skip through ads, the use of the PS3 controller is quite easy for those that know it. For non-PS2/PS3 people, I’d agree with Tony to get the Blu-ray controller to lessen the learning curve. There were a couple of minor glitches (2-3 in a 30 min recording) in some of my recordings (both SD and HD, with + without using other functions of the PS3 at the same time), however I have noticed a number of glitches in live digital channels anyway so cannot blame the ‘multi-tasking’ of the PS3 whilst recording for causing these glitches. I noted that to play a game, it asked me to quit PlayTV (similar to your experience with the Media Centre) , BUT still recorded the TV shows I had set to record (even popping up a notification that the recording was starting/ending during the middle of the game) so believe as long as the PS3 is on, PlayTV will still record. I will do more testing shortly! One thing to note, I only have 1 TV so this converged device raised some questions, notably about how to arbitrate/regulate/dictate who can watch/play/record at any stage. We do most things as a family so compromise is the order of the day. The best part of this system is that it truly is an entertainment hub – Not many other devices can allow you to watching movies & TV, recording TV, playing games, playing media (photos, music, videos from a home network) out of the box with very little (less than 30 mins) setup/learning time. Thanks a lot for your review. My son is bugging me to get Sony Play TV. I think I can get one before Christmas after your review on this. Thanks again for sharing your view about this product. Great review! I was thinking about getting a Wii, but after reading your review I think I may do the PS3 + Play TV combo. Thanks again. And I did not buy it as a games machine but as a PVR/Media Centre and for Iview as well. Must say it was annoying however that I had to go through the whole processes of setting up a Playstation network ID just to access Iview. (only after googling for it that is). The machine new it was in Australia already so why did I need to get a PlayStation network ID. Just seems a little tedious to me. I agree Wolf, it was not obvious to me either during my testing. Although I would say it was fairly straightforward to join the PlayStation Network (PSN) by selecting the menu options on PS3. It does seem unnecessary for iView per se, but I guess that was the deal done between Sony and the ABC – after all there are other benefits to being a member of PSN (see http://au.playstation.com/psn/) and Sony understandly want people to join and explore their network. Yep nice review. i received one on request for an xmas present. my only gripes so far are that you have to quit from the play TV application to go back to the XMB to be able to do other tasks. It also means the PS3 has to be ‘always on’ for TV. It also means you cannot watch TV just through the normal tuner on your tv as the aerial is now plugged in through the play tv device and not directly into your tv. maybe an aerial splitter might do the trick to allow both? i think that would be good in order to preserve the components (fan, HDD, etc) inside the ps3 from having to work for hours on end if you are watching/recording TV. Im presuming there will be a firmware update/s in the future to bring in/fix up features – eg. record 2 shows at once without stuttering. My sister nearly bought one recently, but then opted for the beyonwiz as she needs to record 2 shows at once and couldnt find any definite news on the play tV being upgraded for this in the future. let me know if anyone finds that out for sure! EDITOR: yes an antenna splitter costing a few dollars will do the trick. The Play TV hardware can only record 1 tuner and play 1 tuner at once. I bought ps3 and play tv today. I live in regional area. To my surprise, I couldn’t get any SD channels through Play tv. Any idea?